Dark energy and dark matter comprise 96 percent of the total mass of the universe. 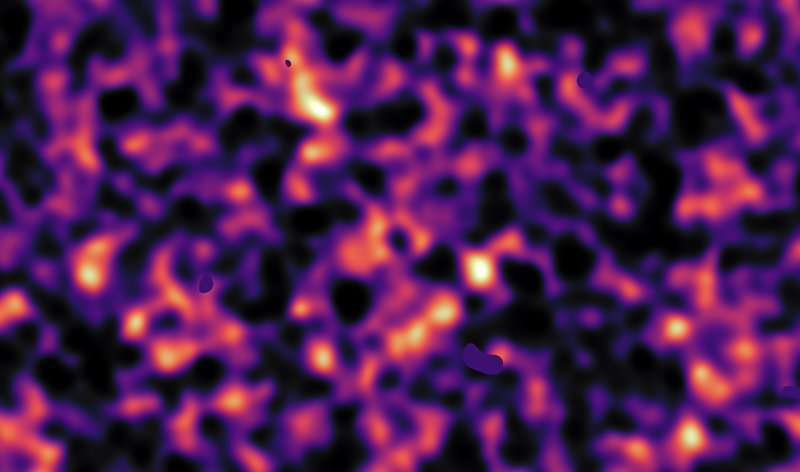 Two main hypotheses about the nature of dark matter are presently debated. One posits that dark matter consists of massive compact halo objects; the other ascribes this property to weakly interacting mass particles. Professor Alexander Balakin and Ph.D. candidate Dmitry Groshev support the second viewpoint, but note that it's probable that dark matter comprises axions, pseudo-Goldstone bosons capable of interacting with photons. Dmitry Groshev says, "The interesting trait of axion electrodynamics is that modified electromagnetism equations allow for the existence of effects that would not be possible in the classic Faraday-Maxwell theory. One such effect is the emergence of axion dyons, objects with parallel radially oriented electric and magnetic fields." Dyon magnetospheres can exhibit the Pannekoek-Rosseland effect. The essence of the phenomenon is that spatial distribution of electric charges happens in equilibrium isothermal plasma under the influence of a gravitational field—heavier ions with positive charges descend under the lighter electrons. This radially oriented electric field is known as the Pannekoek-Rosseland electric field. Such a field, then, is not present in the electron-positron plasma because positive and negative charge carriers have equal masses. Axion dyons can demonstrate stratification of electron-positron plasma and specific distribution of magnetic fields. "We are currently directing our efforts at formulating concrete proposals for astrophysicists to help them find traces of axions in star plasma, and possibly, decipher one of the most important riddles of the modern space research—identifying the particles that comprise dark matter," concludes Professor Balakin. Can the donut-shaped magnet 'CAPPuccino submarine' hunt for dark matter? Dark matter is a supersolid that fills empty space, strongly interacts with ordinary matter and is displaced by ordinary matter. What is referred to geometrically as curved spacetime physically exists in nature as the state of displacement of the supersolid dark matter. The state of displacement of the supersolid dark matter is gravity. I would like to offer my own explanation for dark matter; it includes an explanation for the behavior of Oumuamua. I paste an abstract here along with a link to my article on this. MACHOs have been ruled out by searches for gravitational micro-lensing events. What remains is heavy WIMPs and light WIMPs. Heavy WIMPs are nearly ruled out by particle searches for kinetic recoils; light WIMPs are currently the best remaining hypothesis. Axions are light WIMPs. It's either that or an undiscovered field effect in relativity. But we'll have to wait for more data, no matter what. What remains is heavy WIMPs and light WIMPs. It is nice to read something relevant to the subject after the crackpot comments poisoned the thread (but of course they can't help themselves). The experiments that seems to have most effectively ruled out nearly all heavy WIMPs is not direct searches but the ACME [!] measurement of the sphericity of the electron. So axions is likely our next best alternative, since there is no prior constraint for heavy WIMPs to be so massive. But I note that alternative gravity theories has been about as effectively ruled out by the first multi-messenger observation of a neutron binary merger, if that is what "field effects in relativity" refer to. The remaining simplest alternative after axions is a particle sector that acts only through gravity, which would be unprecedented (since all other fermions interacts rather promiscuously) and unfortunate (hard to learn more)..